This lovely painting by James Gurney appeared in the July, 1987 edition of the National Geographic, long one of my favorite magazines since early childhood. I’ve had multiple collections of hard copy editions, gathered over the years and then given away when moving (they’re heavy!) and then gathered again. I recently scored a complete set on DVD that included everything up through the 90’s – it still runs on my XP virtual machine – so I was able to get rid of all but the few special editions I wanted to keep. Invisible ingredient in countless products, the soybean plays an amazingly pervasive role in everyday life. 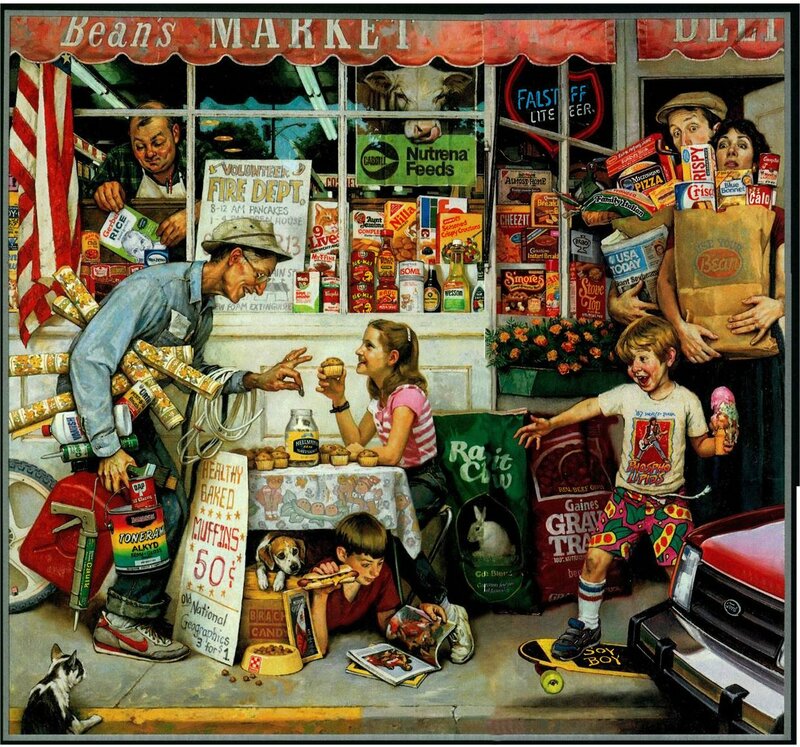 Artist James Gurney included more than 60 soybean-related products in this painting, done in the style of Norman Rockwell. He not only called on neighbors and friends for models, but also portrayed himself and his wife emerging from the store, startled by a skateboarding boy carrying a cone of tofu “ice cream”; the boy’s shorts-like the tablecloth-bear a bean-pod motif. Cardboard, glues, and animal and human foods are commonplace soybean products. The sidewalk customer’s caulking, paint, wallpaper, gasoline, and the muffin he buys all owe a debt to soy-as does the bicycle tire. The beer sign reflects the use of soy meal in the brewing process. The fire extinguisher uses soy protein in its foam. And pre-1981 National Geographics were printed on soy-lecithin-lubricated presses. The car symbolizes an experimental one built with soybean plastic by Henry Ford. 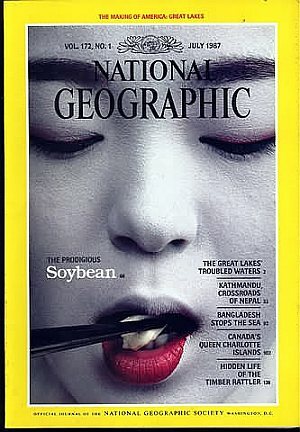 The artist’s final tribute: He used soy-based paint. There’s a lot of conflicting information out there regarding the health benefits or detriments of soy; it’s hard to know who’s right at this point in time, but I’ll keep enjoying my tofu and other fermented soy products. In the meantime, I thought I’d share this delightful and intriguing work of art. I love photos like this. At one point I had a beautiful production still of Margaret Hamilton as the wicked witch of the west, autographed to me and procured for me by my father. Sadly, it was purloined about 25 years ago by one of the young men I used to serve as a Webelos den leader; I was never able to recover it. On the other hand, I have a number of great production stills of my dad in various rôles, so I’ve got that going for me, which is nice. 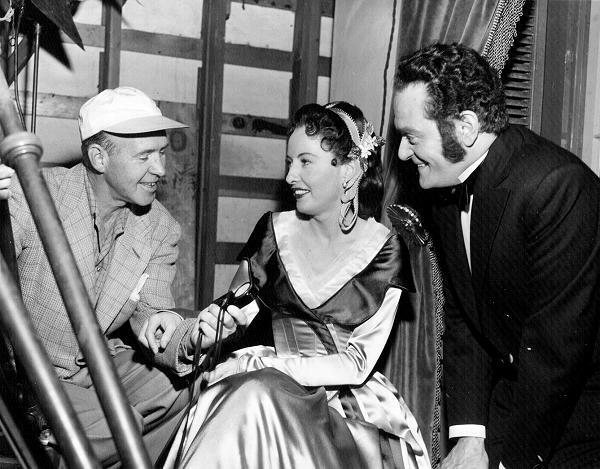 Dad with Barbara Stanwyck and a lighting technician: “Man with a Cloak,” 1951. Today is John Steinbeck’s 112th birthday – or would have been, if he weren’t dead. But some pictures that ran across my Facebook feed this morning seemed somehow relevant. May 1921. Washington, D.C. “Professor Charles Seeger, a composer, is a brother of Alan Seeger, the war poet. 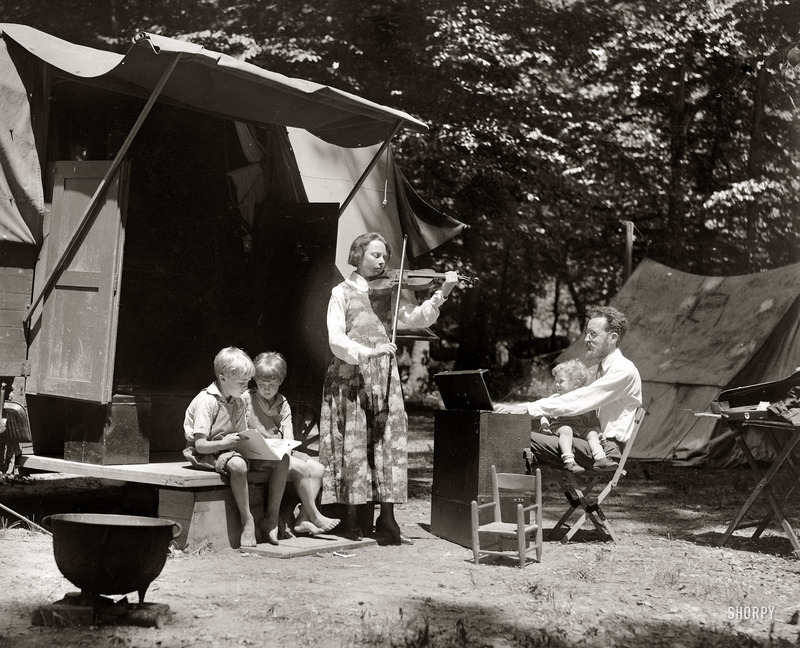 His wife is a distinguished violinist.” Little Pete Seeger, 2 years old, and family along with their camping rig. 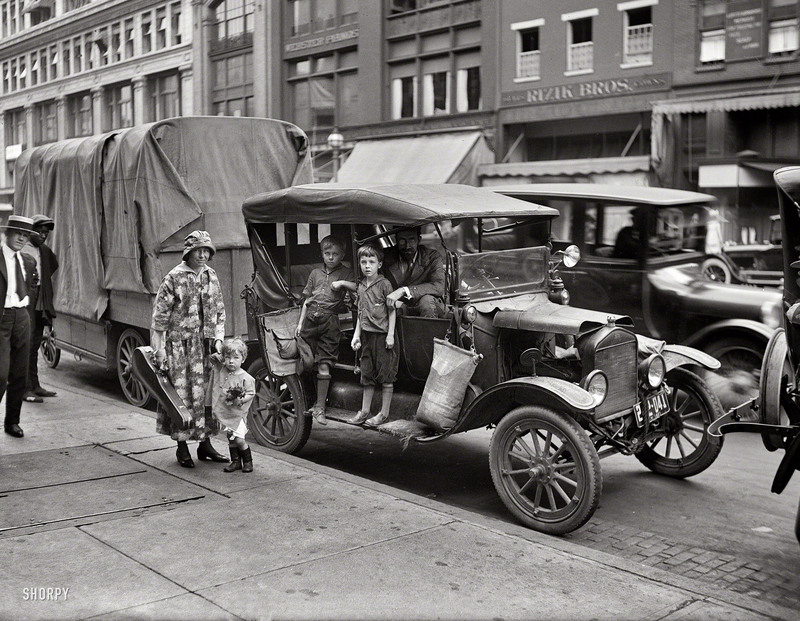 Harris & Ewing Collection glass negative. Washington Post, May 22, 1921. Mrs. Seeger Famed as Violinist. Husband Professor of Music In California. Bound for wherever they happen to stop, paying no attention to daylight saving or other forms of time, and spreading music wherever they go, Mr. and Mrs. Charles Seeger, once of the University of California and now “wandering minstrels” of the world at large, are encamped at Rock Creek park, their home an itinerant Ford and a home-made trailer. They are accompanied by their three little boys. Mr. and Mrs. Seeger, the latter known in musical circles as Constance Edson Seeger, are taking the boys to museums and places of interest wherever they stop, and the two [older] boys are learning to play the violin. “We are trying to solve the problem of educating three boys, and at the same time lead a worth-while outdoor life,” said Mr. Seeger yesterday. Mr. Seeger says that they got the idea while they were at the University of California, where he was head of the music department for seven years after graduating from Harvard and studying music in Europe and where Mrs. Seeger gave violin recitals following her graduation from the New York Institute of Musical Art and a course at the Conservatory of Paris. The Seegers came here from Richmond and to that city from Pinehurst, N.C., where they spent some time. In addition to the three boys, Charles, 8; John, 6, and Peter, not yet 2 [actually, he had just turned 2], they have taken with them Miss Marion Brown, whom they picked up at Pinehurst and who tutors the children and cares for them while their parents are giving concerts. The Seeger “home” is a house of five and a half feet in width by fourteen feet in length, and contains all the comforts of home, including a sewing machine, a portable organ and games for the boys. It even has a front porch, which slides under the trailer while traveling. The Seegers spent the winter at Pinehurst and are now en route to the New England States for the summer, expecting to go back South when the winter approaches again. Increasing rents make no difference in their lives, as a camping place is always available. Mr. Seeger is the brother of the famous war poet Alan Seeger, whose “I Have a Rendezvous With Death,” written shortly before he died, has become immortal. Mr. and Mrs. Seeger gave a concert lecture at the Corcoran Art Gallery last night. May 23, 1921. Washington, D.C. “Professor Charles Louis Seeger and family.” Charles Seeger, wife Constance Edson Seeger and their 2-year-old son Pete, of future folkie fame. National Photo Co. Collection glass negative. Another image of the itinerant Seegers. These images have nothing directly to do with Steinbeck, but there’s a distinctly “Grapes of Wrath” feel about their living style in these pictures. They weren’t destitute like the Joads, but my mind couldn’t help but make the connection. There is part of me that would love to be able to live on the road… as long as I had a comfortable motor home with some bookshelf space and the funds to support such a lifestyle. The advice is for your reference only. This e-mail is confidential. It may also be legally privileged. “SAVE PAPER – THINK BEFORE YOU PRINT ! 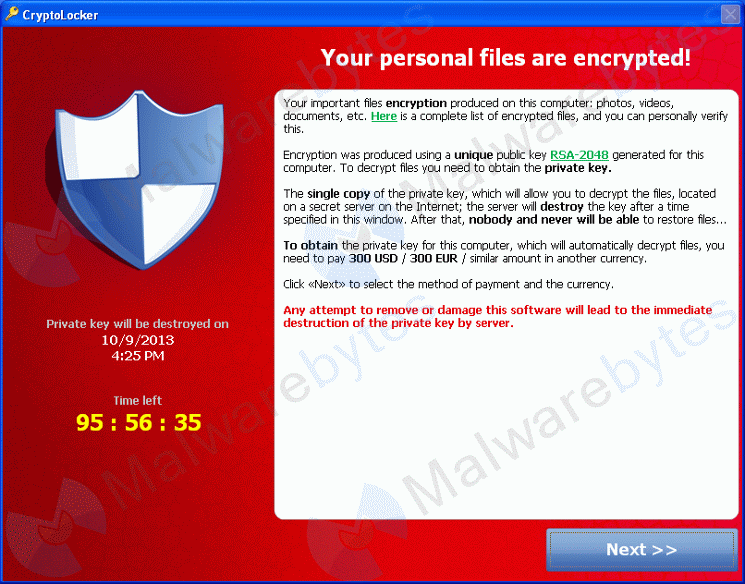 Unfortunately that attached file is not a payment notice, but an executable file (a program) which will infect your computer with malware, adware, spyware, and heaven knows what else; turn your machine into part of a robotic network (a botnet) for spreading spam and viruses, search for passwords and sensitive financial data, encrypt all your files and demand a ransom to unlock them (this is a particularly nasty one), or any number of other unholy things. If WordPress supported blinking text, I’d use that obnoxious tag too, just to make sure I had your attention. attachments from unknown or non-trustworthy sources.” This is misdirection at its finest; people will be grateful for the warning, if they even bother to read it, and happily execute the malicious payload. The executive summary here: NEVER OPEN EMAIL ATTACHMENTS FROM PEOPLE YOU DO NOT KNOW AND TRUST! As a follow-up to my post on strange ways of making music, I share with you an astonishing performance of the Mario theme (it seems to be a very popular demonstration piece) on an odd Chinese instrument called the Sheng, one of the oldest Chinese instruments known. It has an odd quality that combines a wind instrument with a steel drum. The thing I love best about this performance is the incorporation of some of the game’s sound effects into the piece. There is more of interest in the world than I could possibly learn in a thousand lifetimes. I have a lovely computer. It’s really the first time in my life I’ve had a machine that was more robust than my needs dictated; it’s a nice Dell i7 core box running Win7 Pro and it runs like greased lightning. But over the past year or so, I’ve been plagued by one glaring problem that I couldn’t diagnose properly… until tonight. It was my context menus. Right-click on anything, and that dratted menu would take about 30 seconds to pop up. 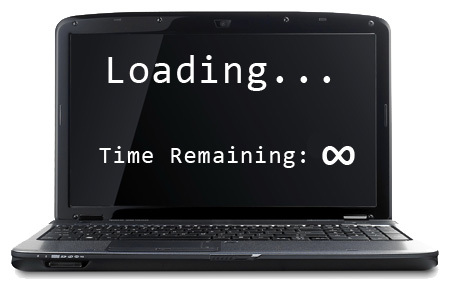 When you’re working away at a project, you need speed and responsiveness, and this was getting worse and worse. Googling suggested the problem was in a defective context-menu handler, probably a third-party one, and recommended a number of long, involved, and messy investigations. I installed ShellExView and disabled shell extensions one by one, or in clusters using a binary search pattern, but nothing helped. Nothing. Ploret des yeulx, ma barbe blanche tiret, I was about to slit my wrists in frustration – but I finally found the culprit, something that didn’t show up in shell extensions or elsewhere: MPCBContextMenu. It’s a context menu handler that was installed on my system along with JustCloud, my current backup program. JustCloud works well, I have unlimited storage, it backs up my stuff quietly and unobtrusively, and it was fairly cheap for a two-year plan. But this particular .dll file is a steaming mass of camel ejecta, and just pulling it out of my Program Files directory and re-booting solved the problem. There are hardly words to express my relief. By the silken breast of Mogg’s mother – if you are having the same difficulty, go search for this file. It’s probably in your program files (x86) directory under JustCloud. Kill it. Exterminate it. BURN it with FIRE! 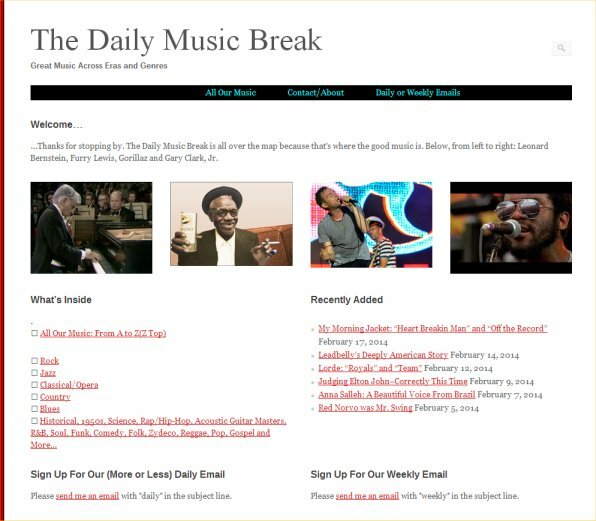 Updated daily, this website is a good way for people to listen to new music that they might not otherwise. I think Grooveshark just took a back seat for a while. Mad props to Carl and his son, redditor /u/karsforkidz for creating and sharing this.